RUSH: I have to be on my best behavior today, folks. 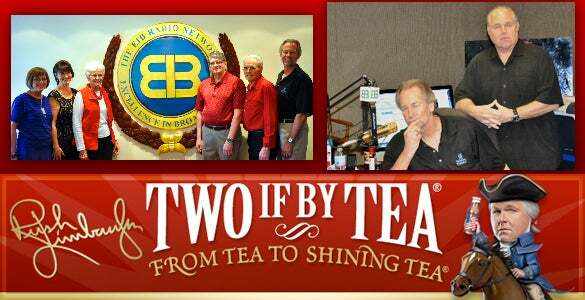 We have some guests here at the EIB Southern Command, honored winners of the latest dream package prize from our Two If By Tea sweepstakes. We have six fantastic people from across the fruited plain here living their dream. They’re here watching the EIB Network today. They’re right there on the other side of the glass. They all had their photo taken sitting here at the Golden EIB Microphone before the program. What an attractive bunch of people they are! I mean, it’s a cross-section of this country. They are just a solid, great-looking group of people, which is what comes from drinking Two If By Tea. Look what it’s done for me, and it’s done the same thing for them. We’re happy to have them here, and it’s always a fun thing to do, to be able to bring people who listen to the program in here and actually sit down with them. I’ve always said, “Radio is not to be seen; it’s to be heard,” but this program is a little bit different.